Citrus trees -- oranges, tangerines, grapefruits, lemons, limes, kumquats, etc. -- are among the most gratifying fruit trees to grow. They have beautiful evergreen foliage, highly fragrant flowers and, best of all, they produce vitamin C-packed fruit at a time of year when most other fruit trees are dormant. However, citrus trees have very particular care requirements, which differ substantially from most other fruit trees. Fortunately, for the most part, all varieties of citrus, including both full-size and dwarf specimens can be cared for in the same way. A big part of keeping citrus trees healthy and productive is creating and maintaining the ideal growing conditions. This starts with planting them in a sunny position with well-drained soil. 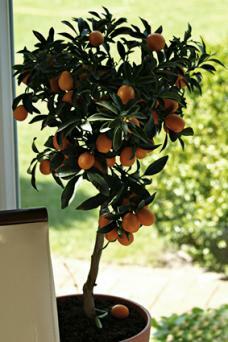 If other trees grow over them and cast shade, cut back the limbs periodically to maintain sufficient sun for the citrus. They should get at least eight hours each day, year round. Likewise, if adjacent shrubbery encroaches from the side, cut it back so good air flow is maintained around the citrus. Good air flow is important in preventing fungal disease. It's also a good idea to maintain a weed-free area underneath citrus trees, as the weeds can rob nutrients and moisture from the citrus. Maintaining a 4- to 6-inch layer of mulch around the trees helps to keep weeds under control and conserves moisture as well. Citrus requires consistent moisture year round. At least one inch of either rain or irrigation is needed each week during warm weather though during cool conditions little to no water may be needed. It is just as important not to over water as it is to provide sufficient moisture. As a general rule, water whenever the top inches of soil become dry. Also, it's best to water the trees at ground level, as excess moisture on the leaves encourages fungal disease. Citrus trees are 'heavy feeders', meaning they require fertilizer to grow and produce optimally in any but the most ideal soils. 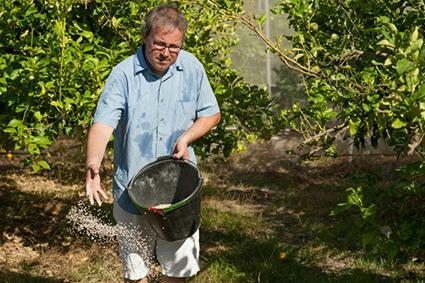 The easiest way to fertilize citrus is to purchase a fertilizer that has been formulated for the purpose. Special citrus fertilizers are available in most garden centers and have the proper balance of micronutrients required by citrus. Application rates vary based on the product, but a typical dosage is one pound per year in age of the tree applied three times per year. Spread the fertilizer evenly in an area about twice the diameter of the tree, watering the ground before and after spreading the product. Avoid fertilizing in the cool part of the year when there is a danger of frost. Instead, spread out the three applications evenly during the main growing season -- once in May, again in July, and once more in September, for example. Citrus is attacked by numerous pests and diseases. Below are some of the most common, with suggested remedies. Alternaria brown spot causes leaf and twig dieback and the abortion of immature fruit. Visually, it appears as small dark spots on the fruit and leaves, surrounded by a large yellow area. Copper-based fungicides may be needed throughout the growing season to control the disease, especially in the warm, moist spring months. Citrus greening is caused by a bacteria that causes deformations in the leaves and fruit. The leaves may appear yellow in some cases or mottled in others. The fruit often drops prematurely or hangs on the tree without fully ripening. There is no cure for the disease, though the healthier the tree, the less likely an infection. 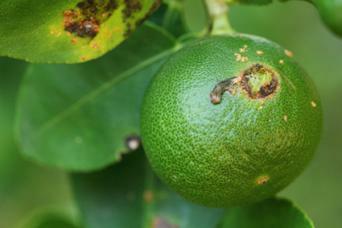 Citrus canker is a bacterial infection that causes lesions on both foliage and fruit. The lesions start as sunken brown spots, but over time they may become enlarged and develop a cork-like texture. Copper fungicides are the primary agent of control. Aphids are a sap-sucking insect which is very common on citrus, but they are usually a temporary problem that comes and goes. Severe infestations weaken the tree, however, and are often associated with, or may be a vector of, disease. The tiny insects congregate on the succulent growing tips of the plants. Horticultural oils and insecticidal soaps are two options for controlling aphids. Citrus leaf miner is a tiny insect that burrows into the leaf surface and feeds on the tissue, leaving serpentine trails that are visible on the leaf surface. The leaves often become curled and deformed in response. Insecticides are not very effective at treating leaf miners, but parasitic wasps can be released to control their numbers. As evergreen subtropical species, citrus plants do not show the same level of seasonal variation as most deciduous fruit trees, but there is a general seasonal cycle to be aware of. Most flowering occurs in spring and the fruit usually ripens over the winter. However, new flowers may appear at any time, so there are sometimes flowers and fruit in different stages of development at the same time on a given tree -- lemons are especially known for this. Citrus do not require pruning for health and fruit production like most fruit trees, but there are occasionally reasons to prune them. Because the flowers and fruit develop at the tips of the branches, any form of pruning reduces the fruiting potential of the tree. Citrus naturally grows in a dense bushy way and does not need pruning to thin out the canopy. However, dead or diseased wood should always be removed as soon as it is noticed. The trees can also be pruned for shape or to control size. Some gardeners may wish to prune off the lower branches to expose more of the trunk. The best time to make any cuts for aesthetic purposes is in early spring before the first flush of flowers. Citrus are not very cold hardy. Kumquats, 'Meyer' lemons and some mandarins will survive temperatures as low as 18 to 20 degrees, while grapefruits and limes are damaged at 30 to 32 degrees. Most other varieties fall somewhere in between. If cold weather is a rarity in your area, protection from the occasional frost can be achieved by covering the trees with plastic tarps at night. Dwarf citrus can be grown in pots and brought indoors for winter in cold climates. Potted citrus should be placed in a sunny indoor location and rotated periodically to expose the different sides of the plant to the light. 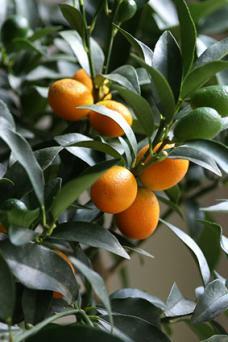 Water whenever the top surface of the soil becomes dry, but do not fertilize while the citrus is indoors for winter. White flies and scale can be a problem with indoor citrus, but these pests can usually be kept under control by regularly spritzing and wiping off the leaves. The only way to be certain that citrus fruits are ripe is to try them. They should be fully colored, but it may take months after they color up to rach the peak of flavor and juiciness. The fruit can stay ripe on the tree for weeks or months, so it usually not necessary to harvest it all at once. Just pick them as you need them.